Last Saturday it was snowing, so we decided to make an amateur video of Steffi stripping! ENJOY! Our trusted paint stripping technique starts with the heat gun to remove the easy stuff. We then use a chemical stripper to get rid of the hard parts and the detail. Lastly, we sand the remaining stain off with 180 grit sandpaper. It’s a pretty involved process (that looks easy in the video), but the results are worth all the effort. The music is by Jack Tuttle. He has some wonderful MP3s on his website, and he even gives lessons if you are in the San Francisco area. His website is www.jacktuttle.com. Thanks Jack! 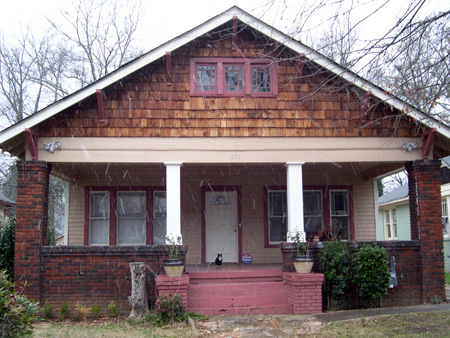 Posted in General, Our Bungalow | Tagged chemical, dining room, heat gun, paint, paint removal, paint stripping, southwest atlanta, stripping, video, westview, westview bungalow | Comments Off on Steffi Strips! Little flakes coming down earlier on. Lately Patrick and I have had the problem of project skipping. I’m sure everyone’s pretty familiar with this…you start one thing, get fed up or bored with it and move onto the next, etc. Since we were working for months on the kitchen built-in butler’s pantry and got stuck and fed up with it we started various other things. One of those projects has been removing paint from the built-in in the bathroom. Another one was the plan to paint our bedroom. Except for the kitchen and bathroom (which were the main rooms that were re-done) the rest of the house is still a sterile and dull white. We had received a $10 off coupon from Lowe’s, so we thought we’d take the opportunity to buy the paint. We went there on December 31st only to realize the coupon had expired on the 30th, haha. We wanted to proceed with the project anyway and went ahead and bought some paint. Painting always seems like such a quick and easy thing to do, but it wasn’t until we got to doing it that we realized that it wasn’t so quick and easy after all. Moving all the heavy and bulky furniture, taping off corners, wiping the dust off the walls, making sure you don’t paint the ceiling…it all takes time. In the end it took us a week to finish it. 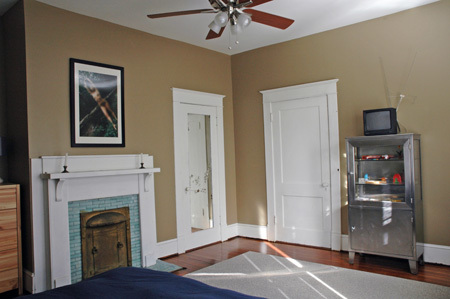 We immediately got used to the painted room and realized how much it helps to make our house feel like a home. 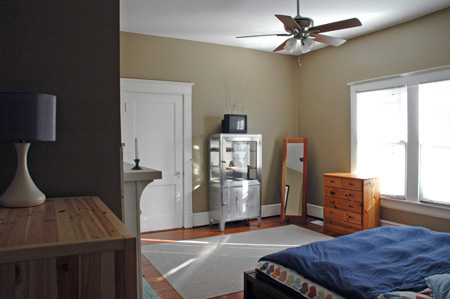 The white paint just has that generic renter’s feel, so adding the splash of color was definitely what the room needed. Plus painting it actually made us feel like we’re making progress! The project skipping of course isn’t helping with getting anything done. 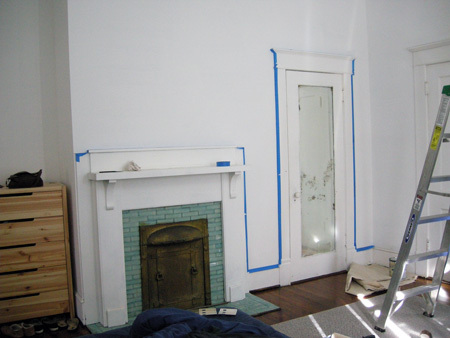 But the other thing is that the other projects are mostly paint removal, which is a very time consuming task. With the cases of the butler’s pantry and the bathroom built-in we’re just removing paint to put a fresh coast of paint back on, so to outsiders they probably don’t even know the difference or that we’ve been spending 3 months working on one piece of furniture! It’s a little frustrating, but hopefully in the end it’ll make all the difference. In the living and dining room, where we intend to remove the paint and stain the wood, people (and us too) will truly be able to tell that work has been done. 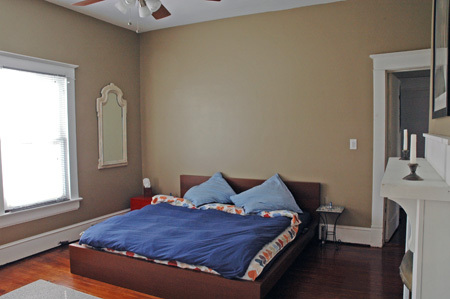 The wall above the bed is still a bit bare, but we’ll hang up photos soon. We just have so many we haven’t been able to decide what to put up yet! Between Christmas and New Years Patrick and I decided to go on a little post-holiday escape – the destination being New Orleans. I had been there with my family some 10 or 11 years ago, but Patrick had never been. The “great” thing about doing a home renovation is being able to put those big sums on the credit card. (Sounds like my mom’s favorite phrase – “the more you buy, the more you save”, hahaha.) And that’s when it pays (quite literally really) to have one of those point credit cards that lets you redeem things. So thanks to our new stove, bath tub, toilet, etc. 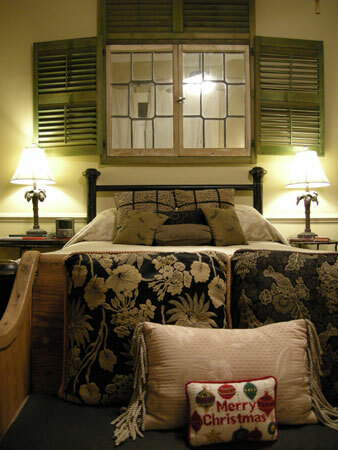 we were able to get a couple of nights for free at the International House Hotel in New Orleans, woohoo! On the way to New Orleans Patrick had scouted out the town of Convington, a cute historic town north of New Orleans on the other side of Lake Pontchartrain. He had narrowed it down to two Bed and Breakfast’s, so during the 7-hour drive I called the two places to make sure they had vacancies and verify their cost. 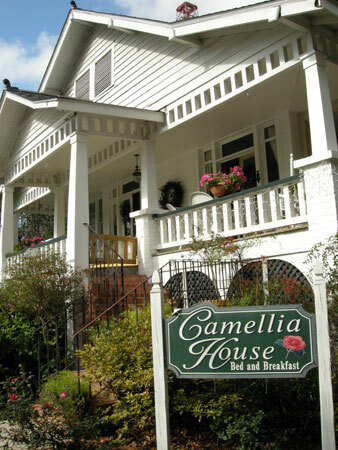 We opted for Camellia House, and as an added bonus when I called back the lady told me she would even give us a discount because there would be a little bit of construction noise. Camellia House ended up being the cutest Bed and Breakfast we had ever been to! Well, the whole town is pretty cute for that matter, made up of tons of cottages and bungalow homes. Absolutely adorable!! But Camellia House and Linda (the lady running the place) were absolutely wonderful. We would recommend this bed and breakfast to everyone! Patrick wanted to add that the Camellia House also has a really nice hot tub to relax in! Camellia House from the outside with lots of beautiful landscaping. 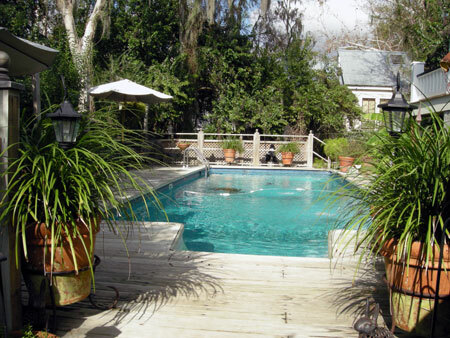 The exterior was just gorgeous too – here’s a view of the pool. 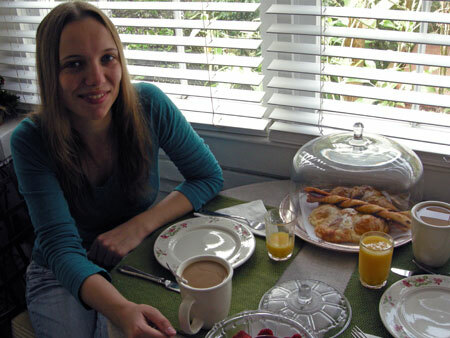 Here’s me about to enjoy a wonderful breakfast with coffee, orange juice, pastries, and fresh strawberries. 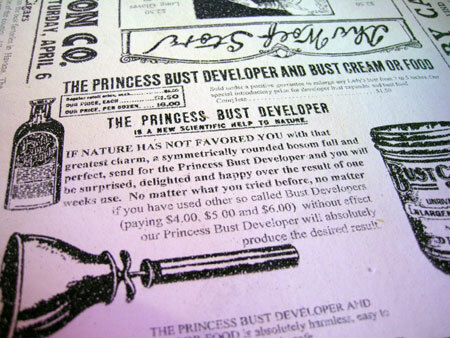 This table cloth from Buster’s Place was too funny I had to take a picture and post it here. So after spoiling ourselves a bit with the bed and breakfast for the first night we went on to our free hotel for the next two nights. The International House Hotel is in the Business District, but just one block from Canal Street and the French Quarter. We’ve read reviews on Trip Advisor how it seemed to be a necessity to stay in the French Quarter, but we were really happy we were close but just outside of it because we realized there’d probably be a lot of noise had we actually stayed anywhere in the French Quarter. Especially since the Sugar Bowl was coming up on January 1st and all the football hooligans were starting to trickle into town and were eager to drink and party. While we were in New Orleans we did a lot of the typical tourist things like try a muffuletta at Central Grocery, have lunch and a sazerac (the “original cocktail”) at Napoleon House, have beignets and coffee at Café du Monde, having a Po Boy sandwich at ACME Oyster Bar, travel to the fancy historic Garden District by street car, do a cemetery tour, walk along Bourbon Street and enjoy a $1 street beer, listen to an awesome brass band on a street corner on Frenchman Street, visit Jackson Square, visit the 1850 house, visit Madame John’s Legacy house, take the free ferry across the Mississippi to Algiers to visit Mardi Gras World, etc, etc. Some of the unique experiences we had were stumbling into a photography exhibit/shop that sold original photographs by masters such as Diane Arbus, Helmut Newton, etc. The most expensive photograph I saw hanging on the wall was a $175,000.00 Diane Arbus photograph. It was a little crazy standing in front of such an expensive, original piece of art work! I mean, I suppose in museums you do it all the time, but I suppose it was a little bit crazy because we just walked into this photography place (because we both love photography) and didn’t expect to enter a place that would sell original pieces from such famous photographers! 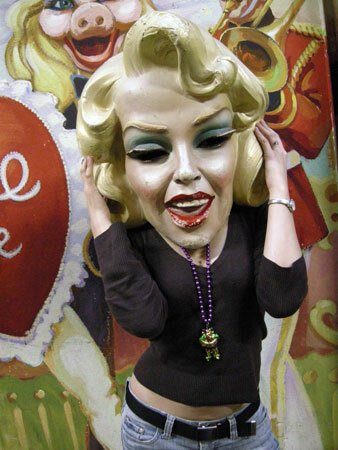 Another pretty crazy experience was going to Mardi Gras World and meeting Mr. Mardi Gras himself, Blaine Kern. This 81-year old gentleman could have easily told people he was 60 had he wanted to. 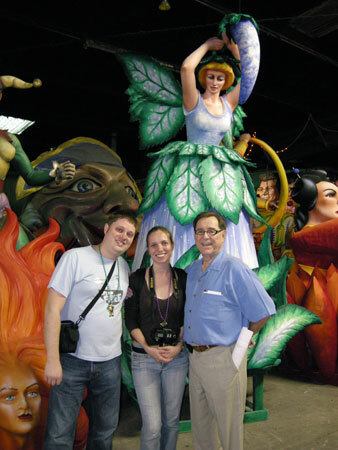 We did the overpriced tour of the warehouse containing a ton of vibrantly colored Mardi Gras float materials. At the end of the tour we were told we could wander around to take photographs. To our surprise the crowd cleared out and we were the only people remaining. So we walked around, taking photographs of all the crazy motifs when Blaine Kern walked over to us and started talking to us. He told us about his new plan of starting a Halloween parade and turning New Orleans into a popular Halloween spot. The proceeds from the “Krewe of Boo” costs would go towards funding for firefighters and policemen to be brought back to the city of New Orleans after their displacement during Katrina. Quite a project to start for an 81-year old. One should also note that Mr. Mardi Gras produces 75% of the Mardi Gras floats and has turned this into a $20 million a year industry in the 60 years he’s worked on it. Quite impressive. Playing around with old Mardi Gras items. Posing with Mr. Mardi Gras, Blaine Kern. 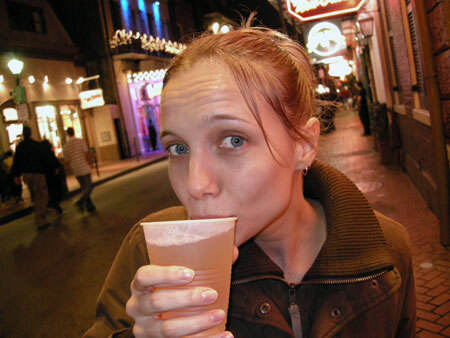 Enjoying my $1 Bourbon Street beer. 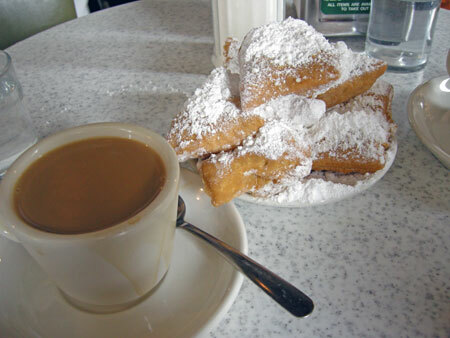 Sugary goodness at Café du Monde. After an uneventful and dead night out on a Saturday in Baton Rouge we returned to our stinky motel room. Shortly after we decided to walk next door to Super Target to buy incense to help us breathe in the room. (To our amusement the Super Target sold liquor! A no-no in Bible-belt Georgia.) The incense made the room mildly bearable. 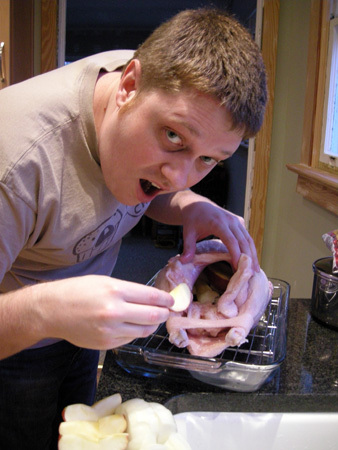 We finally went to bed, though Patrick kept tossing and turning for a while due to his horrors of the unsanitary room. In the meanwhile I attempted to block out the gross thoughts but was kept up by Patrick tossing and turning. Finally, when we had just about dozed off, someone tried to enter our room. After telling them the room was occupied (hey, been there, done that earlier on in the night!) they left. We tried to get back to sleep only to have to receptionist call at 11:45pm asking why we were in the room and me having to explain the whole ordeal. The conversation included being “accused” of breaking into the room. Or at least that’s how I interpreted the question of “Was the room door open and you walked in?” Yes lady, I just walked into an open motel room door and made myself at home!! We once again attempted to doze off, only to be disturbed by another phone call at midnight. Needless to say I was quite annoyed by this time, and since I was half asleep again I don’t quite remember what insults I may have thrown her direction at this point. 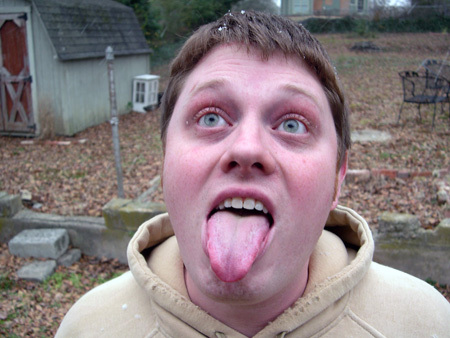 After finally getting to sleep the phone rang AGAIN at 2:00am, but whoever called hung up. Patrick was wise and unplugged the phone at this point. 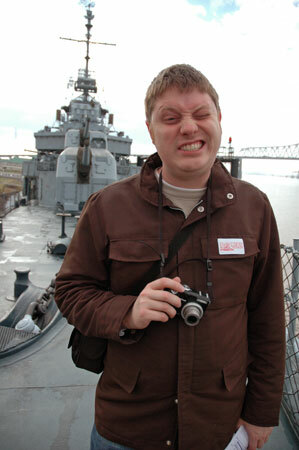 Being off to an earlier than usual start we went to see the USS Kidd (an old warship) and the state capitol building. The state capitol, built in 1928, was absolutely gorgeous on the inside. The free elevator ride to the top was also nice and we got a nice view of the area. 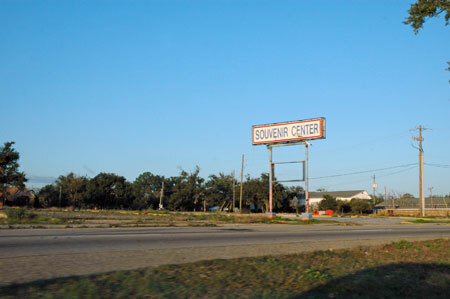 We then headed back to the ATL, driving along the Mississippi coast and experiencing the damage left by Katrina. We had seen some of the impact in New Orleans. The tourist area had shown no sign of damage, but the northern area we drove under had been quite depressing. The raised I-10 bridge looked like a refugee camp underneath with one tent squeezed next to the other. 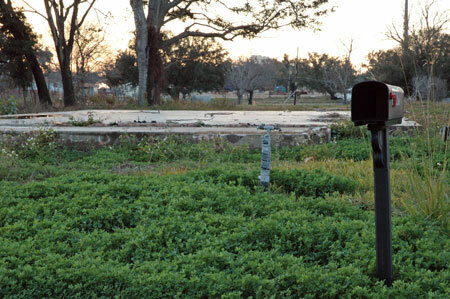 The houses north of I-10 were largely occupied by FEMA trailers in the front yard. But when we drove along the coast through Bay St Louis, Gulf Port and Biloxi it was very crazy to see the obviously desirable beach front property remaining largely empty. There were lots of brick stairs leading to nowhere and lots of commercial signs with no commercial buildings left. Some houses had been rebuilt and looked stunning, but about 90% of the land was probably empty. The rest of the ride back home was rough. We were tired from our lack of sleep the night before, so after the night time driving and dangerously thick fog along the way we were very happy to be back home and get a good night of sleep in our own bed. 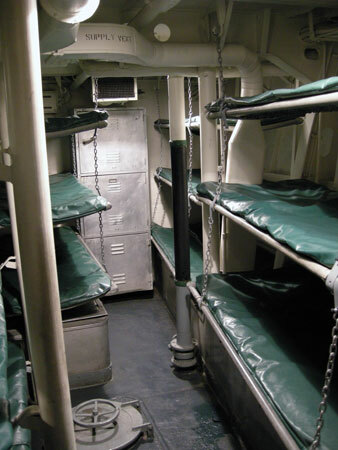 Luxurious beds in the USS Kidd. 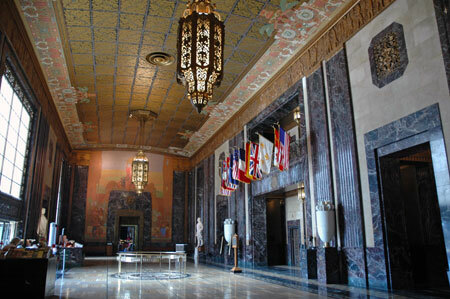 The beautiful interior of Louisiana’s state capitol building. Tourist trap without a building. Now that we had a nice trip it’s back to working on our home! Since I’m German, and German’s celebrate Christmas on Christmas Eve, I decided I wanted to do something nice on the 24th to preserve at least a little bit of my German tradition. (And since Patrick’s family takes care of the American tradition side.) 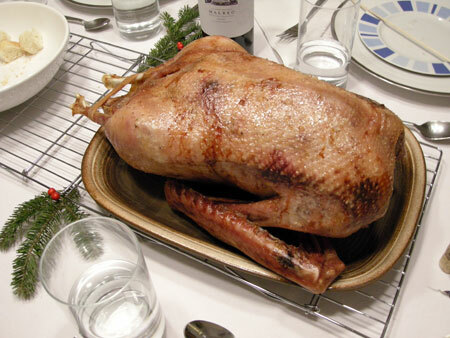 Some traditional meals for this day are goose or carp, so we decided to try the goose this year. And to keep things in more of a European Christmas spirit we thought it would be nice to invite some of our Polish neighbors from neighboring West End! 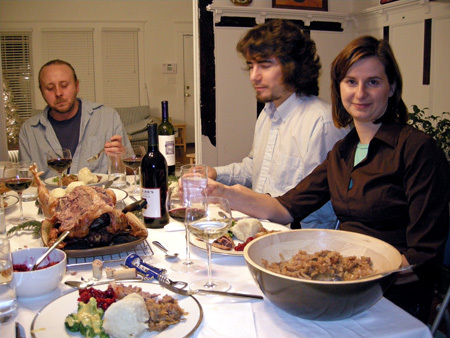 As we figured out they have several similar traditions to Germans, such as celebrating Christmas on Christmas Eve and eating carp as the main dish. Look at that beautiful crispy brown goose! With all the holidays, and this, that and the other going on it feels like on one hand we haven’t been very productive with the house, but on the other hand we did have extra days off were we were able to focus on some projects. I’ll try and post some of those soon, like progress in the bathroom, progress in the bedroom, and a little 4-night getaway between Christmas and New Years where we saw some inspiringly cute cottages. So stay tuned for those updates!